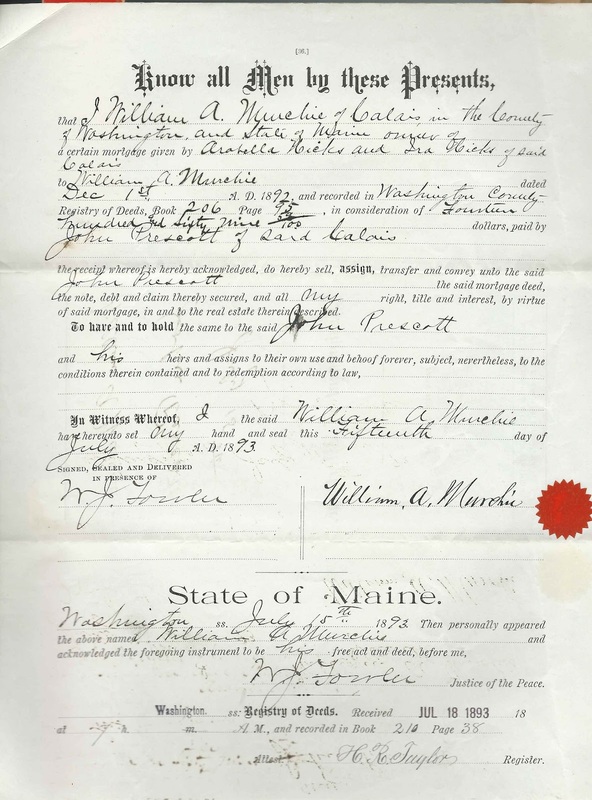 Assignment of mortgage signed July 15, 1893 by William A. Murchie to John Prescott, in a mortgage originally given to Murchie by Arabella Hicks and Ira Hicks of Calais, Maine. 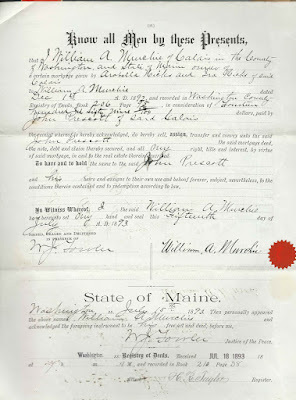 William Andrew Murchie was born March 25, 1841 at Oak Bay, New Brunswick, not far from Calais, Maine. He was the son of James Simpson Murchie and Mary Ann (Grimmer) Murchie. William married twice: 1) Ella Todd, with whom he had four children; 2) Mina DeHart Rounds, with whom he had two children. William Andrew Murchie died July 16, 1923 at St. Stephen, New Brunswick, across the St. Croix River from Calais, Maine. Read more about the Murchie family here, in Maine: a History, Volume 4, edited by Louis Clinton Hatch, published by the American Historical Society in 1919. John and his wives and other family members are buried in the Calais Cemetery at Calais, Maine. Ira Hicks, a sawmill operator, and wife Arabella (Estabrooks) Hicks were New Brunswick natives who lived at Baring, Maine, and Calais, Maine. Arabella died at Calais, Maine, on September 26, 1909. Her death record indicates that Ira had predeceased her.